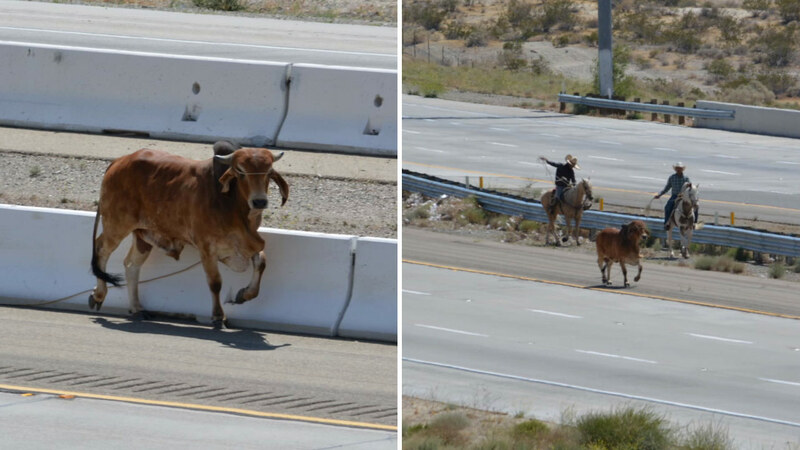 A bull wandered onto the 15 Freeway near Dale Evans Parkway and wranglers on horses worked to guide the bull off the road on Saturday, May 16, 2015. APPLE VALLEY, CA -- A bull wandered around on the 15 Freeway near Dale Evans Parkway and temporarily stopped northbound traffic Saturday. Authorities were called to the scene shortly after 2 p.m., and wranglers on horses tried to lure the bull off the freeway. After an hour, the bull was finally taken into a trailer. It is not clear where the bull came from or how it wandered onto the highway.